Want to know how to get information across to readers and listeners so they absorb it, and can act on it? I've never read any book that does a better job of conveying this than the one pictured below. I don't like marking in books. Call me old-fashioned if you want. But there are some (if it's your own copy), that you have to treat as tools, and any way of pulling the most out of the book is fair game - including marking it up. "Made to Stick" by Chip and Dan Heath is such a book. First time round, I read it with a highlighter in my hand, marking ideas that caught my imagination or made a point that was fresh to me and seemed significant. Anyone reading it for the first time would find it hard not to mark this book, it has so many convincing insights that just feel right. But it's not just a feeling - many important assertions are backed up with examples taken from careful research and trials. At the same time there are stories and examples that make it all real to the reader. After the first read, I went through it again, building a mind map with a focus on the points I'd highlighted. Then I used what I'd learned in a project, and that came out as something quite different from anything I've done before, and from feedback I've had, much better as a result. If I had to sum up 250 pages in a single phrase, it would be "Avoid abstraction" but this book doesn't just tell you what not to do, it tells you what to do in its place and how to do it. It is just first rate. 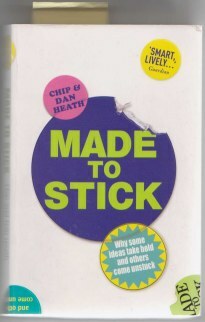 You can check it out on Amazon: Made to Stick: Why Some Ideas Survive and Others Die . 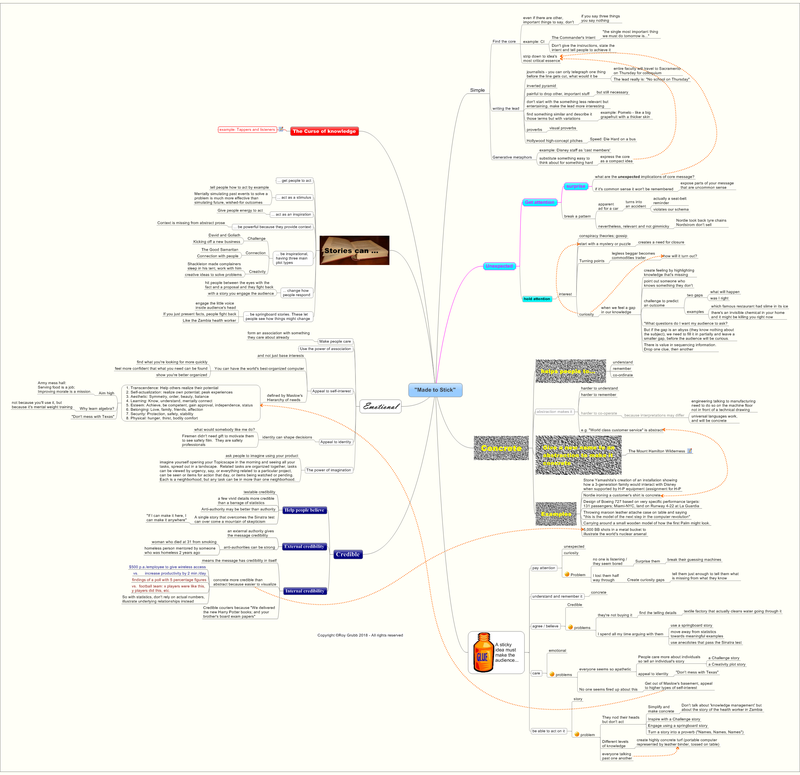 Here's a small image of the mind map I made. Click the image to view a larger, detailed version. Depending on your browser and browser settings, this may download as a zip file. If it does, download it anyway, and then change the .zip to .mmap. If you open the .mmap file, you will be able to read the notes attached to some branches - notes that give more explanation that you won't see in the image. The pdf file is here. The mmap and pdf files are for you to use for your own work, but you may not publish it other than by including the above thumbnail image, with a link to this page. A note: Mindjet, the publishers of MindManager, provide a free viewer for mmap files. You can get it here. In fact it's the full version of Mind Manager which gives you 30 days to try it out, and when the trial period is over it blocks the editing functions and becomes a read-only viewer for as long as you want to keep it.